Share the post "Symptoms after UFE"
Already had the UFE procedure and are experiencing some symptoms? Find out if what you are experiencing is a common post-UFE symptom. UFE is intended to impede the blood flow to the uterus by way of blocking blood supply to the uterine artery and for that reason, it should not influence the function of the ovaries that dictate the onset of your cycles. However, there can be varying degrees of sharing of the blood supply between the uterus and ovaries (collateral blood supply) which can influence the function of the ovaries after UFE. If this is the case, your cycle should resume on schedule the following month. If it does not, or you are skeptical about your individual situation, we suggest that you consult your physician to ensure that you are not experiencing premature menopause. Premature menopause occurs in a small number of women and its cause is unknown. Patients older than the age of 40 may face a higher risk of premature menopause as they are closer in age to approaching menopause. Regarding the abdominal swelling that you are experiencing, it should gradually subside. Abdominal fullness or swelling is common after the procedure and the time it takes for the swelling to go down varies on an individual bases. If you have any additional questions, please feel free to contact our medical team at 866-362-6463. We will be more than happy to answer any of your post-UFE questions! 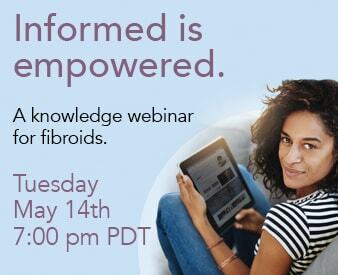 Have a comment or question related to fibroids? Scroll down to post a comment to this blog or Click here to ask your question.